.RAPIDLY INTENSIFYING LOW PRESSURE EAST OF THE VIRGINIA CAPES WILL BECOME A STRONG STORM ABOUT 100 TO 150 MILES EAST OF ATLANTIC CITY THIS EVENING...THEN PASS JUST EAST OF NANTUCKET EARLY SATURDAY. LOOK FOR SNOW AND HAZARDOUS TRAVEL NEAR AND NORTH OF INTERSTATE 78 TODAY AND MOSTLY RAIN ELSEWHERE. THEN AS COLDER AIR DRIVES SOUTHWARD INTO THE REGION LATE TODAY ON NORTHERLY WINDS TO 30 MPH...ALL AREAS WILL SEE SNOW FALL WITH VARYING RATES. THIS WILL RESULT IN DETERIORATING TRAVEL CONDITIONS FOR THE EVENING COMMUTE. TRAVEL TONIGHT INTO EARLY SATURDAY SHOULD BECOME TREACHEROUS... ESPECIALLY IN EASTERN PENNSYLVANIA AND ALL OF NEW JERSEY. BLOWING AND DRIFTING SNOW MAY BECOME A PROBLEM...ESPECIALLY ACROSS NORTH CENTRAL AND NORTHWEST NEW JERSEY. 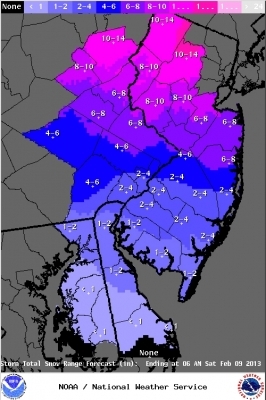 * LOCATIONS...MUCH OF SOUTHEAST PENNSYLVANIA NORTH AND WEST OF PHILADELPHIA THROUGH CENTRAL AND SOUTH PORTIONS OF SOUTHERN NEW JERSEY. * ACCUMULATIONS...SNOW ACCUMULATIONS 4 TO 10 INCHES...ALONG WITH AROUND A TRACE OF ICE. EVEN IF ACCUMULATIONS ARE ONLY AROUND 4 INCHES THE ...COMBINATION OF SNOW AND TEMPERATURES FALLING BELOW FREEZING WILL PROBABLY BECOME A MAJOR TRAVEL PROBLEM DURING THE EVENING COMMUTE...ESPECIALLY AFTER 6 PM. * TIMING...MOSTLY RAIN DURING MIDDAY. PRECIPITATION CHANGES BACKTO SNOW LATE THIS AFTERNOON AND EVENING. THE SNOW WILL FALL HEAVILY FOR A TIME...WITH A PERIOD OF 1 TO 2 INCHES OF SNOW AN HOUR POSSIBLE. NORTH WINDS WILL GUST TO 35 MPH... CAUSING BLOWING AND DRIFTING. * IMPACTS...VERY HAZARDOUS TRAVEL IS EXPECTED FOR THE EVENING COMMUTE AND WELL INTO THE NIGHT WITH VISIBILITY DOWN TO ONE QUARTER MILE AT TIMES. ISOLATED POWER OUTAGES ARE POSSIBLE. * TEMPERATURES...LATE TODAY AND TONIGHT FALLING INTO THE 20S. * LOCATIONS...NORTHERN DELAWARE...FAR SOUTHERN NEW JERSEY TO PHILADELPHIA. * ACCUMULATIONS...SNOW ACCUMULATION 2 TO 5 INCHES. * TIMING...PERIODS OF MODERATE TO HEAVY RAIN TODAY WILL CHANGE TO SNOW LATE IN THE DAY OR THIS EVENING. THE SNOW COULD FALL HEAVILY FOR A SHORT TIME TONIGHT... BEFORE TAPERING OFF LATE TONIGHT. NORTH WINDS WILL GUST 35 MPH... WHICH COULD RESULT IN SOME BLOWING AND DRIFTING OF THE SNOW. * IMPACTS...HAZARDOUS TRAVEL IS EXPECTED FOR THE EVENING COMMUTE AND WELL INTO THE NIGHT WITH VISIBILITY DOWN TO ONE QUARTER MILE AT TIMES. ISOLATED POWER OUTAGES ARE POSSIBLE. * WINDS...NORTHWEST 15 TO 25 MPH WITH GUSTS UP TO 35 MPH.